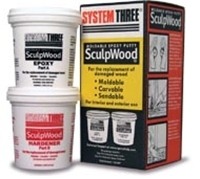 System Three SculpWood Putty is a 2-component, solvent free, kneadable epoxy. It is moldable, carvable, lightweight, strong, and exhibits excellent adhesion to a variety of substrates. It is easily sanded and will accept paint, screws and nails. Frequently used after Rot Fix application, to replace missing sections of exterior wood. Excellent for repairs of dents and chips in furniture and very popular to fill missing or broken sections of carvings. Easy to use; simply scoop an equal amount of Part A & Part B in your gloves and knead the two components together until a uniform color is achieved. Press and form the Epoxy into cracks, holes or build up missing sections. Allow to cure for about 8 hours before sanding and finishing as required. Waterproof for exterior and interior applications, but should not be used as a structural repair. Cure time 8 hours @ 25c for basic work. Kneads easily into a putty. Press into cracks, dings and holes or shape to replace entirely missing sections. Use over rotted wood repaired with Rot Fix. Good Shelf-Life (keep on hand for household or shop repairs). Sands, carves and accepts screws & nails. Can be finished with paint and stains.